Around 1925, a young man, fresh out of high school, went to work for The Ridgefield Press. Carleton Scofield assisted editor David W. Workman with writing news and setting the printing type by hand. Pretty soon, Scofield was doing much of the weekly’s work, especially when Workman was out fighting forest fires in his capacity of state fire warden or policing the town when he was on duty as a local constable. 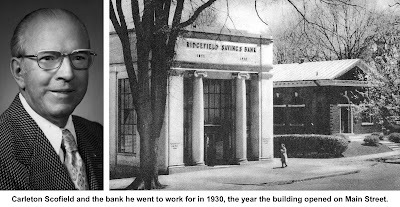 The bank’s directors overruled Keeler, Scofield was hired, and eventually he became the eighth president of the institution, now the sizable Fairfield County Bank. He also became one of Ridgefield’s most active and involved citizens. A native of Ridgefield, Carleton Avery Scofield was born in 1905 and graduated from Hamilton High School on Bailey Avenue in 1925. 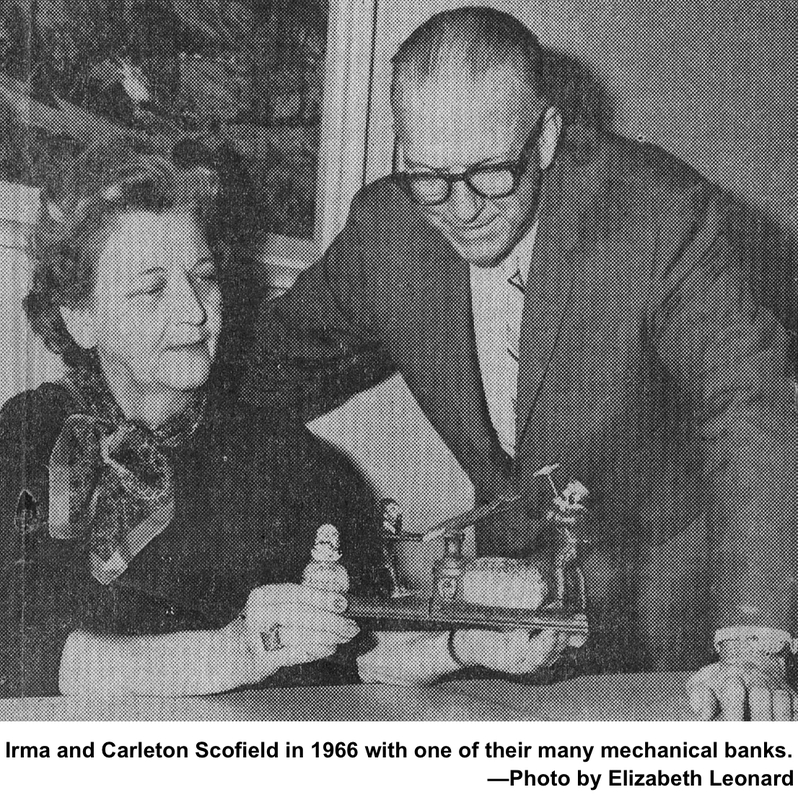 After four years at the Press, Scofield began his banking career. He studied at the American Institute of Banking, at the Graduate School of Banking at Rutgers, and at Columbia. He began as a teller in 1930, the year the Art Deco bank on Main Street was built. He was named an incorporator in 1933, a director in 1942, secretary and treasurer in 1946, and president in 1955 — a position he held until his retirement in 1972. He was chairman of the bank’s board until 1981. He was also active in regional and national banking affairs, serving as an officer of the Mechanics Bank Association of America and president for four years of the Savings Bank Guarantee Fund of Connecticut, a predecessor of the FDIC. Scofield was a prominent public official. In 1926 at the age of 21, he was first elected a justice of the peace, an office that then wielded some power in Connecticut. People who were arrested by constables, state police, or fish and game wardens were tried before a justice of the peace in the town hall. The arresting officers decided which justice to bring their case to, and some justices were more popular than others. Scofield was among the popular ones and got a good deal of the business, Nash reported. When the state established the trial court system in 1941, Scofield was named a trial justice, presiding over Ridgefield’s court in town hall. He held that post until 1961 when the local trial courts were merged into the circuit court system. However, he did quit briefly in 1960 when he became enraged over the fact that 10 boys who’d been “engaged in a gang fight at Lake Mamanasco” and two other boys caught stealing auto parts all got off in Town Court on legal technicalities. He called it a “circus-like treatment of justice,” but he soon returned to the job. For 11 years, Scofield served on the Police Commission, including periods as its chairman. He was treasurer of the Connecticut Police Commissioners Association, a director of the Connecticut Public Expenditures Council and a member of Governor Thomas Meskill’s task force on housing. Locally, he was a president of the Lions Club, secretary of the Ridgefield Library, treasurer of Ridgefield’s Salvation Army unit, an incorporator of the Boys Club, treasurer of the Fairfield County YMCA, and active in other organizations, including an antique car group. In 1930, he was a leader of one of Ridgefield’s first Boy Scout troops. During the 1950s and 60s, he dabbled in real estate development in town. A bit of his name lives today in Scodon Drive, a road at the 57-lot Scodon development that he and savings bank lawyer Joseph H. Donnelly subdivided in 1958. Banking was not only a business but a hobby. Scofield and his second wife, Irma, were widely known for their extensive collection of mechanical and cast-iron toy banks. By 1970, he had more than 250 mechanical models and 600 “still” banks — many were exhibited in the Ridgefield Savings Bank’s several offices. Some dated back to the 1700s. Scofield died in 1983 at his retirement home in Florida. He was 78.